We're paws-ing (get it? ha ha...) our Cat-I-Tude focus for this week to share another quilt made by Ann, using her Here Comes the sun fabric. 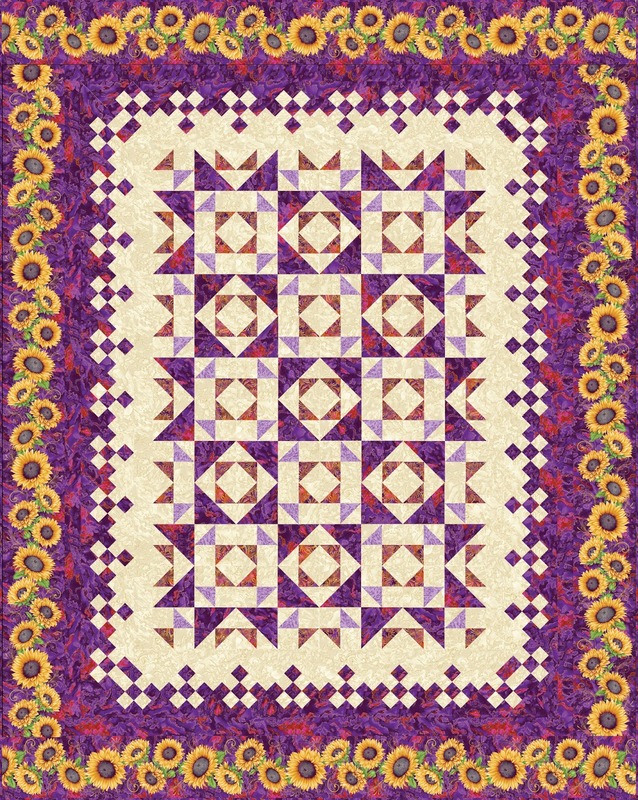 Starring Sunflowers is featured in the January/February 2018 issue of Love of Quilting magazine, and is also featured in the PBS Love of Quilting TV Series 3100 (check your local PBS station for listings). featured in Fons & Porter's Love of Quilting January/February 2018 issue. 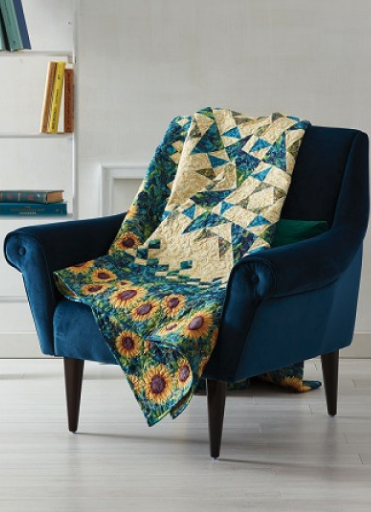 Tell us about the pieced quilt center. One of the things that makes this quilt interesting is the way four blocks come together and look like a larger block. You can’t tell what the block unit is at first glance. It’s all done with combinations of simple units—half-square triangles and triangles. It makes an involved-looking block. 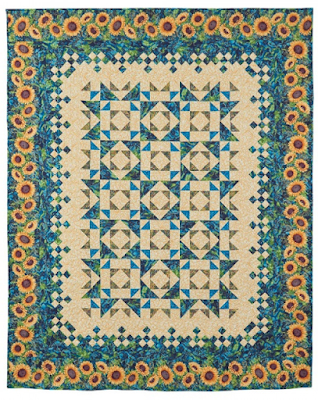 The border treatment in this quilt is so interesting! It’s not a typical border treatment, is it? Nine-patch units on point and setting triangles create a border that flows from the cream quilt center background to the teal dappled texture print. Strips of those two prints around the nine-patches provide breathing space as well. The nine-patches create a delicate look—the edges almost disappear into the next border. Why did you choose to use sunflower fabric only in the outer border? The coordinate prints used in the quilt center have so much movement and interest, and I wanted to focus on them. Sunflowers, and splotches of partial sunflowers cut up to fit in the design, would interrupt the design. I thought these coordinates were pretty and worked well together. And the final touch, the outer sunflower stripe border? All the beauty in a stripe like that really shines in a wide border. I designed this print so you can cut four stripes of border across the width of the fabric. These sunflowers are actually prettier than those you’d see in nature, thanks to some artistic license. This border gives the sunflowers an opportunity to sparkle. 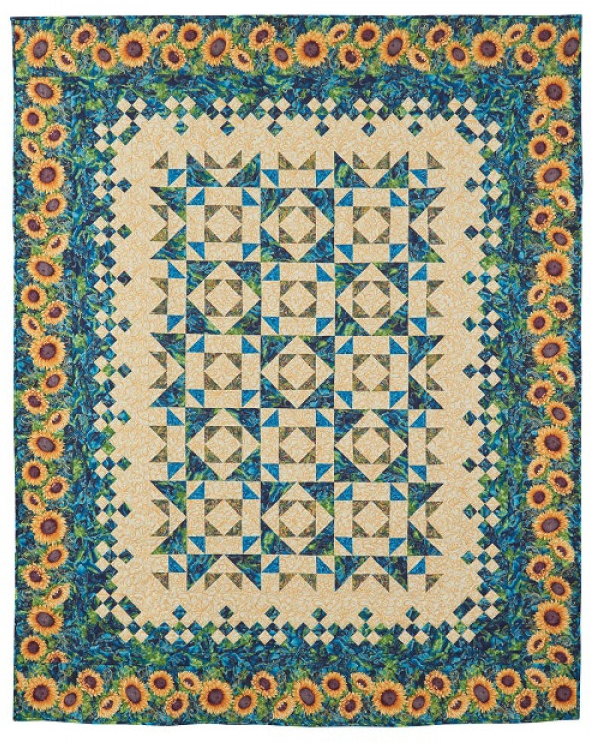 I like the combination of three things: the center piecing that looks involved but isn’t, paired with the delicate nine-patch border, and then the sunflowers adding weight along the outside edge. What about fans of purple? I also mocked up this quilt using the purple colorway! You can see it below, and I have a kit available for it on my website. Click here to read more about Ann's Here Comes the Sun collection. Click here to purchase the pattern and here to purchase the kit. 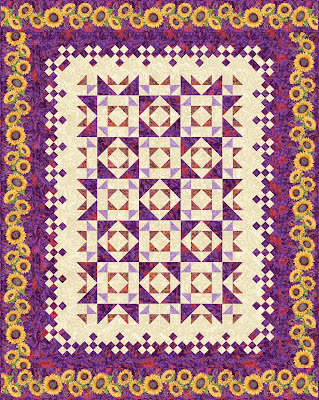 Click here to purchase the kit from Ann in either the purple or teal colorway. 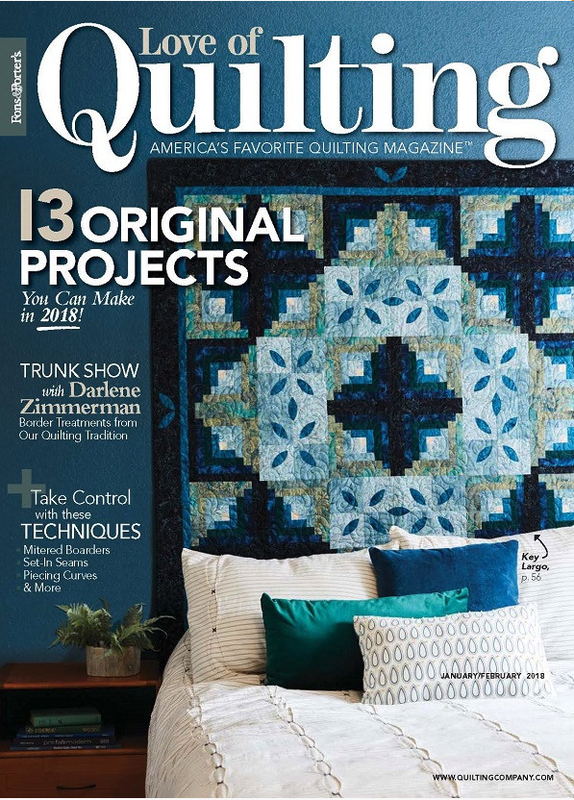 Click here to find Love of Quilting magazine.